Thread Sculpture is the art of creating fabric from machine embroidery threads. Pieces can be formed into any shape imagined. This is a very good technique for those who are new to the machine arts. wonderful results can easily be achieved using only a straight stitch. For flower patterns, look to seed catalogs and books on gardening. Of course, those of you with "green thumbs" can "pick" patterns from your own gardens. Hoop two or three layers of Sulky Super Solvy. With a water soluble pen, draw the outline of the shape to be filled in. Because both sides of your sculpted fabric may be seen at once, thread the needle and the bobbin with Sulky 40 wt. Rayon Thread. For realistic effects, use a darker shade in either the needle or the bobbin. Lower the feed dogs, rmove the presser foot, and set the machine for straight stitch. Outline the shape to set the border. To create the base, circle stitch the entire shape, being sure to let the circles overlap each other, forming "links". Don't worry if you can see small openings of light among the circles, but do try to stitch fairly evenly without large gaps. Now you're ready to stitch the flower texture. Straight stitch over the circle stitches "in the direction of growth". You will actually create a grain, stitched from the center of the flower and fanned outwards to the petal edge. Leaving"controlled" gaps in the work can act as "darts" to help when you're ready to shape the flower. When the petals and leaves are as solid as you would like them, remove the project from the hoop and cut away the excess Super Solvy. Dip embroidered piece in water to partially dissolve the remaining Super Solvy. The Flower can now be "sculpted" to desired shape. Bend the petals for a more natural appearance. If too much Super Solvy was removed causing it to be floppy, you may add a liquid Solvy Stabilizer. While pieces are damp, roll and pinch bud base. Set leaf at base and wrap calyx around both pieces. A number of things can be used as a shaping/drying rack: i.e., a thread cone, a plastic top from a spray can, or you can create exactly the needed shape by making a ring from foil. When dry, secure with sewing machine straight stitches. Glue bar-pin to back and enjoy. 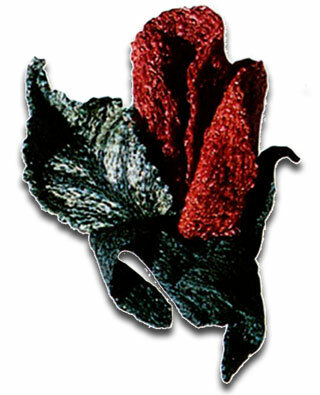 This method is fully described in Yvonne Perez-Collins' book entitled SOFT GARDENS - Make Flowers with Your Sewing Machine, published by Chilton Books. Additional methods of thread sculpture and patterns to use are: "Flutterbys" - Gail Rolet, Chickasha, OK - a pattern featuring monach butterflies; and "Butterfly - Antique Irish Crochet on the Sewing Machine" by Mary Ray Osmus, Benecia, CA.